Many homeowners, whether they just purchased their home or have owned it for years, are interested in increasing the value of their property. A better value leads to greater home equity, a higher resale price and the personal pride of owning a lovely home. Good landscaping can lead to a better home value, and there's no easier way to improve landscaping than with beautiful bulbs. A well-groomed, thoughtfully planned and attractively maintained landscape is a great asset to your home. Your home's exterior, including its landscaping, is the first impression visitors see, and good landscaping creates an attractive, welcoming atmosphere. Colorful landscaping can help attract notice to your property, while larger plantings provide shade and help with temperature control. Borders can conceal fences or unsightly foundations, and flowerbeds soften the edges of the house structure to provide an appealing sense of nature. Unlike interior home improvements that come and go with the latest design trends, good landscaping is a constant asset to your property and your home value. Bulbs are some of the best options to improve your home's landscaping and increase your home value. While bulbs won't grow to provide shade to your yard and don't yield tasty treats in a garden, they have many benefits that add solid value and enjoyment to any yard. While many plants can serve only one distinct purpose, bulbs can serve many purposes. Taller varieties can provide an effective screen for privacy or create stunning borders. Dense bulb patches can "paint" your landscape with flowing color, or bulbs can be layered in pots or containers for instant beauty. 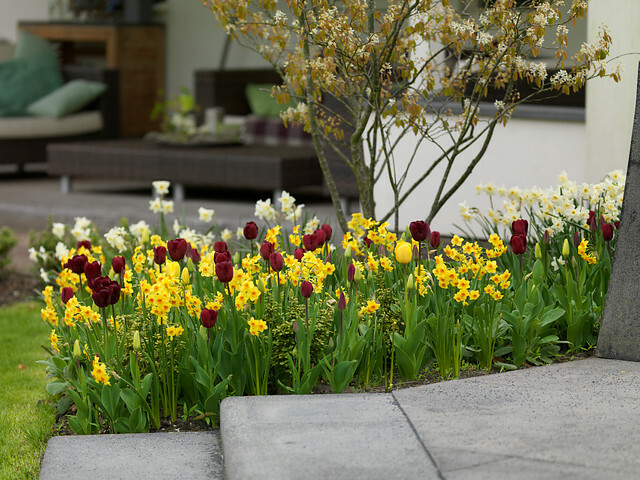 Bulb flowerbeds can be positioned along your home's foundation, around trees or lining walkways, driveways or sidewalks. Bulbs can be strategically positioned to fill in thinner areas in your yard or landscaped beds as well. While summer-blooming annuals or brilliant fall foliage trees may look stunning for one season, many bulbs offer beauty for far longer. Not only are their flowers showstopping beauties, but many bulbs have thick, graceful foliage that is delightful long after blooms may have faded. Furthermore, you can mix-and-match bulbs to keep a bed blooming from early spring to late fall without difficulty. Annual flowers are gorgeous but need to be replaced every year, a process that can be very time-consuming and labor-intensive. Most bulbs, on the other hand, are perennials that will keep coming back year after year with very little extra care. With just basic maintenance – watering and the occasional removal of dead foliage – mostbulbs will grow back more lush and vibrant each year, continuing to add value to your home. There's no denying that bulbs are easy to grow and require very little maintenance to look their best. Bulbs can tolerate a wide range of soil types, pH levels and sunlight levels, and they often thrive even when neglected. This makes them an easy addition to any landscape, bringing their proven value to your yard quickly. It's easy to improve your home's value by adding bulbs. Simply choose the types and colors of bulbs you want, and you're just three steps away from a beautiful landscape and a more appealing home. 1. Dig – Dig the appropriate hole to plant your bulbs, paying attention to the recommended depth for the bulb type. You can dig individual holes for each bulb, or plant an entire bed at once. 2. Drop – Drop the bulbs in the holes. You can position them in graceful, cultivated rows, or choose a more organic, natural look. Cover the bulbs firmly with soil and a layer of mulch if desired. 3. Done! You only need to keep a simple eye on moisture levels and the occasional critter that may enjoy a bulb snack, and you're done with bulb care and maintenance. Before long, both your bulbs and your home value will be blooming! With so many benefits from landscaping and the ease of bulbs to create a stunning look, why not add to your home's value today? Get digging – you'll be done before you know it!